Lilly Widmar is a project manager for Countywide Mechanical Systems. She has 17 years' experience and has worked in many facets of the industry, including welding, pipe fitting, and serving as superintendent. My path to the construction industry has been an interesting one, but I believe every step prepared me for my career today. I began my journey as a light wheel vehicle mechanic while serving in the 82nd Airborne. While in the Army, they sent me to welding school — little did I know that the training would set the framework for the rest of my career and that it would take me to the construction industry. I worked my way from a pipe fitter/plumber apprentice and journeyman to lead foreman and superintendent, eventually becoming a general superintendent. After spending 13 years in the field, I came to Countywide, where I was a general contractor superintendent on my first project in Yuma. I am now a project manager at a job in Northern California. Being on both sides of the business has given me a great perspective, and I have seen many changes during my career. To start, there are more women going into a career in the trades. I can only recall working with three women in the field during my first 10 years, which made it tricky to navigate at times with no one to mentor me, but now there are more opportunities for women — in the office and in the field. There are women on all levels now and career paths opened for any route you could imagine. From installer to coordinator, PM, service, engineering, or design — the field has really opened up on all levels. I think most people just think of swinging a hammer when they think of construction, but that is just the tip of the spear. If you are interested in physical labor and working outdoors, there are so many different trades you could get into. Love math? Engineering could be a great fit. Visual and like creating concepts? Architectural is a great fit. Detailed oriented and like seeing a plan come together? Project management is the option for you. If you just like a faster pace in a less formal working environment, an office-construction trade is a good place to be. 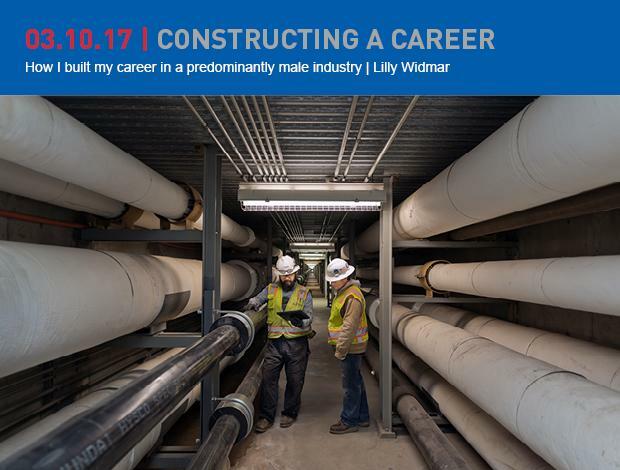 In addition to many different avenues women can take in construction, the ability to change positions and advance are endless. I have seen many things and many changes to the industry throughout my career, and I would offer any female looking to get into the industry this advice: Remember you are not just representing yourself, and your company — you are representing women everywhere. I have been in male-dominated work environments my entire career, and how you approach every day, your work ethic, and your attitude all matter. My work ethic, drive, and determination hopefully made it easier for the women behind me, as I know that I have had women trailblazing in front of me who paved the way for my career in construction. I don’t take that perspective lightly, and I try to remember that it is bigger than just me — I am helping open up opportunities for women to transform the industry in the future.